Electronic affinity is the tendency of a neutral atom to accept a new electron in its gaseous state. The resultant chemical reaction produces an exothermic reaction to produce a negative ion. It is the quantitative measurement in a change in energy when one mole of an atom in its gaseous form is changed into negative ions. Its standard measurement is kJ/mole. 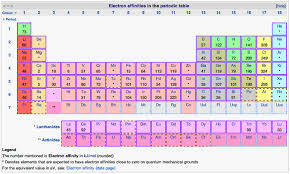 The electronic affinity shows a particular trend as we go about the periodic table. 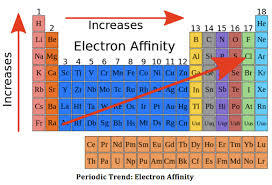 If we go from left to right across the periodic table, the electronic affinity increases. This is due to the fact that as we go from left to right from the periodic table, the size of the electron decreases. Since the distance between the electron and the nucleus is lesser, the force which binds the electron and the nucleus is greater, hence increasing the affinity of the element. As we go from top to bottom across the periodic table, the electronic affinity decreases. This is because the size of the atom increases, hence increasing the distance between the electron orbital and the nucleus. 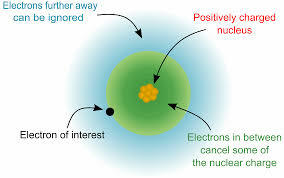 This means the attraction between the electron and the nucleus decreases, thus decreasing the capability of the nucleus to bind any incoming electron. Thus the electronic affinity decreases as we go from top to bottom across the periodic table. Here we are going to share with you the electronic affinity table PDF.